Orchestration, automation, and communication are core tenets required for DevOps success. qTest Pulse helps improve these areas with easy-to-configure workflows that trigger updates across agile and DevOps tools. 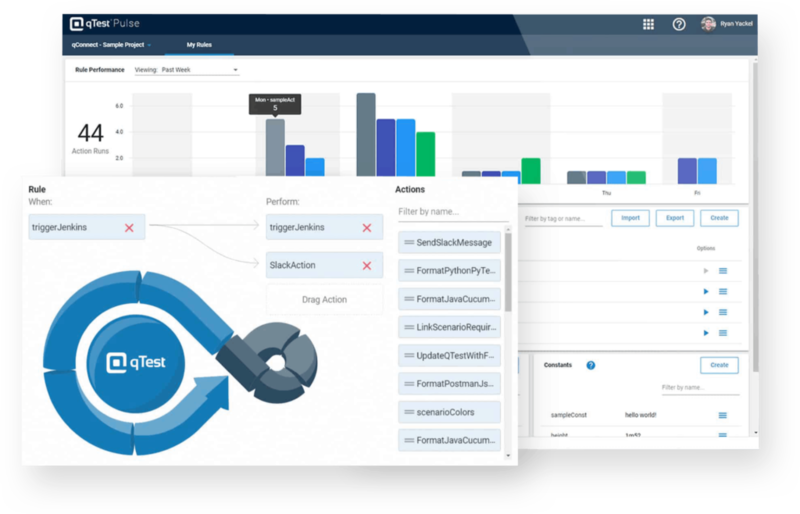 qTest Pulse is an advanced rules engine that helps agile teams communicate faster and collaborate more across all Tricentis qTest products by automating tool communication within a DevOps pipeline. With qTest Pulse, create and store custom rules to automatically update tools across your delivery pipeline when certain actions occur. Sometimes testers communicate a defect description correctly, but it still takes too long to get the defect resolved. While developers might orchestrate an automated build job, they may not have communicated the results to everyone involved with product, dev and QA, causing unnecessary delays. Prevent communication breakdowns by automating updates across agile teams. With qTest Pulse, set custom rules to remove bottlenecks and keep projects on schedule. Take a look at how qTest Pulse rules trigger updates across Jenkins, Slack, qTest Manager and Jira for rapid communication. qTest Pulse can orchestrate those common, frequently executed events across any tool with a webhook in your software delivery pipeline. Here are just some the ways to use qTest Pulse. When a test fails, send a Slack message to notify the owner of the initial requirement. When all tests pass in a sprint, notify the product lead that features are ready for production. Triggers a Jenkins build job using the webhook API. Format test execution results from raw .xml (JUnit style) and send them to qTest Manager. When a test fails 7 times in a row, automatically create a Jira Bug. Format test results from raw Cucumber Java .json and send them to qTest Manager.